Well from that distance I've been tickled to watch the development of a very talented nephew -- Stephen Bauman. I don't know Stephen. I imagine that the last time I saw him he was probably about five years old. Now I'm guessing him to be in his late twenties. But through the wonder that is the internet, I've been able to at least see the kind of work he produces, and stare at the images with amazement and just a little awe. Some day maybe I'll meet Stephen and get a chance to ask him questions like that. For now, that meeting is unlikely -- for the past few years he's been teaching at Florence Academy of Art in Florence, Italy. It's a funny phenomenon: Ariel and Breeze are our third pair of malamutes. All six of them have pretty much gone with us wherever we go. 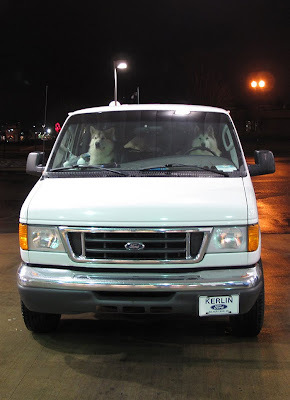 And every time we step out of the truck, the dogs have always hopped up into the seats. And every time (with the current photo proving the exception) the male of each pair has always gotten into the driver's seat, and the female has always taken the passenger seat. So, at first blush yer kinder inclined to think that the male is "taking charge" -- getting in the driver's seat. The human-thinking-based assumption being that whoever is literally "in the driver's seat" is the dog in charge. Funny thing, though. It's actually the opposite. What's really happening is that the females have always been the ones in charge. The males defer to the females, and the females alway choose the seat that doesn't have that obnoxious wheel-thingy sticking part way into their comfort zone. Then, once the female has picked the choicer of the two seats, the male dogs hop up in what's left over -- the driver's seat. Anyway, it was a great weekend. On Sunday, Breeze took his second major and won his breed championship! The dog show was a big event. 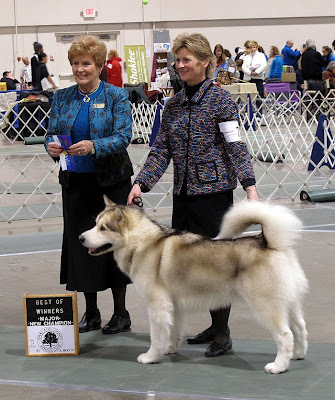 In addition to the conformation trials, they had obedience trials, flyball, and both herding and a weight pull demonstration that was hosted by the Malamute club that Dar and I belong to. Though Breeze has been in harness quite a bit -- skiing with me -- he's had very little experience with pulling dead weight. I mean.....he's had very little experience with pulling deader weight than me in a pair of skis. Here's a video of Breeze participating in the weight pull demonstration. 1976 was my year of ceramic discovery. I was a junior in college and though I enjoyed studies in literature more than any other study, I couldn’t type. That weakness pretty much sealed my fate. Without the skill to type I wasn’t going to be an English major. But I also enjoyed being creative with paint and pencil. And so by default I ended up in the Art Department. And what a discovery it was. The small college’s even smaller ceramics department was in the cobbled up basement of a 60-80-year-old bungalow that was living out its final years of usefulness in whatever way the Art Department could utilize it until the college campus expansion plans would finally tear it down. I entered the basement through the slanted cellar door outside entrance with just a few concrete steps down. That cinder block basement had barely enough headroom to walk beneath the first floor joists. Back in the corner room was just enough space for five kick wheels. I remember clearly, to this day, watching by the light of a bare overhead incandescent bulb as the instructor threw a ball of clay onto the wheelhead with a thud, wet his hands, kicked the wheel to a whirring spin, and turned a pot completely out of nothing. What had been -- not five minutes earlier -- an indistinguishable lump of clay was now a vase shape of distinction and beauty. 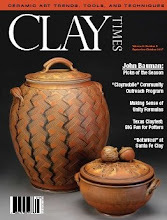 I bring up this history by way of introduction to a series of posts I intend to do on potters whom I have found to be influential in my life as a potter. In most of them you will see little if any connection between my pottery and theirs. 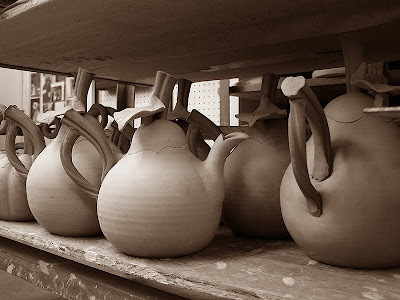 But the gist of the posts – my introducing these potters to you – will be what it is about their work – or the way they work – that I found so compelling. 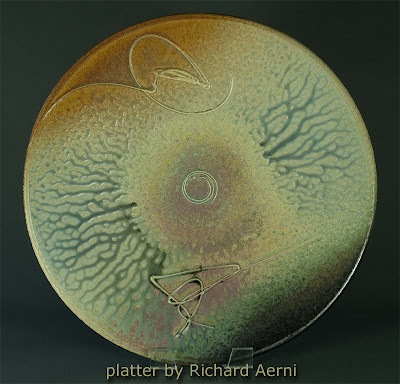 I intend to start with a post about the first potter – Richard Aerni – whose work I found so inspirational that to this day I clearly remember the first time – all those years ago in a college library -- I ever saw his work. In the next few weeks I'll talk about Richard and several other potters who have inspired me, challenged me, centered and shaped my direction in clay. * You might be an artist if you can't explain something without drawing a picture. ...while you are in your thirties. 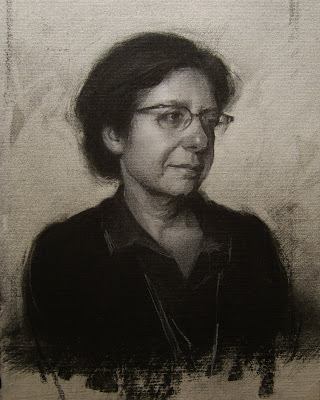 * You might be an artist if more of your sentences begin with "What if..." than they do with "It is...". * You might be an artist if, as a young kid, you knew which rocks worked for drawing on the sidewalk. * You might be an artist if you watch sports for the beauty of the activity rather than the competition. 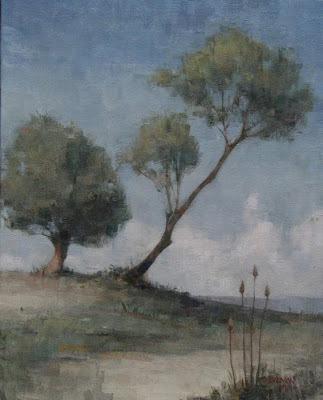 * You might be an artist if you remember the books of your childhood by their N.C. Wyeth Illustrations, but can barely remember their story lines. * You might be an artist if you are easily addicted. * You might be an artist if you've ever noticed that you can taste a color. ...but they can't read your handwriting. * You might be an artist if your name is anything other than "Thomas Kinkade". "...Oh, that's just an illusion of perspective referred to as foreshortening." * You might be an artist if you are missing one ear. 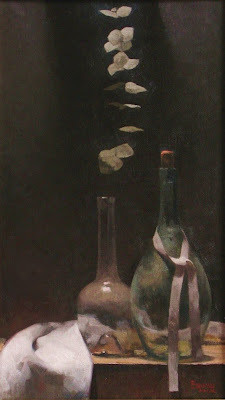 "In this, my most recent body of work, I employ the metaphysical ambiguity implied by the juxtaposition of negative spaces of the imagery of modern day icons with tribal and ancient totems in an amalgam wherein the totality becomes the lesser of two between the “outness” of inside, and the “insideness” of out." * You just might be an artist if you know that "gesso" is not an ambiguous answer. I mentioned in this post that a customer had made my day by posting a photo of the tea set she'd bought from me. It's one of the nicer functions built into the Etsy site that a customer can upload a photo reply in their review/feedback. Well, she did it again. The above photo looks like it's been clipped from a magazine or a cookbook, but it's another photo posted by Susan from down in Georgia. "Tell you what. If you're going to go ahead and buy the pugmill, I'll give you the guitar and banjo for an extra $100 if you want them," Dave said. "It's an old Harmony. I used to play coffeehouses with it back in my college years." Never being one to turn down a guitar for $100, even if the banjo had to come with it, I said, "Sure." I've known Dave for nearly my entire professional life. He's another potter. When I was just a kid starting out – half way through my college years, just married and building a pottery from scratch – I headed toward my very first art fair in central Indiana. I had my '66 Buick Skylark loaded beyond full. Just 30 miles from home, the poor old car broke down on the highway that traces the Eel River ridge across Northern Indiana. After road repairs, I finally got to the art fair a half a day late. Dave was the first person I met. I asked him if he thought it might be worth the extra effort of trying to set up overnight to salvage the rest of the show. A simple roll of the eyes was the first of a thirty-year string of good advice Dave has given me. Dave has taught me the ropes of doing art fairs for a living. He has taught me much about pottery. And he has taught me much about jumping into life with both feet. Life has kinda forced Dave into being a maverick. It's not like life is particularly cruel to Dave. Neither has he found the skids to be often greased. But Dave generally has to figure out his own way of doing things. Dave isn’t exactly “gifted” with the best physical tools to excel at the challenges that appeal to his intelligent, inquisitive mind. For instance, Dave is not built like a potter. He is slight – he’s narrow-shouldered with fine-boned hands. Dave learned early on that he wasn't going to be muscling his way through turning 20 lb. clay pots. Instead, he figured out how to finesse his way through 5 pounders. But Dave doesn't seem to measure the value of a challenge -- or his willingness to attempt to tackle it -- by how well equipped he might be to take it on. And time and again Dave shows character – the best of humanity – not in excelling at those challenges, but in trying, in enjoying those challenges. And I've seen Dave get knocked down. Flat. Wiley Coyote meets the oncoming train in the tunnel. I see him continue to get back up. He doesn't bother to look around to see if anyone saw him topple. Why would he? He isn't attempting the challenge to impress others. He knows the intrinsic worthiness of "try." A life is only empty when it's devoid of "try." Sure, I've learned the art fair ropes from Dave. But the value of "try" is what I'll most take away from the friendship. 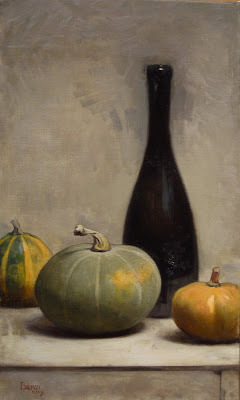 And Dave's tenacity has not just earned him my respect, but a career that has spanned four decades, selling thousands of pots a year in nearly every hard-to-get-into fine art fair throughout the Midwest. 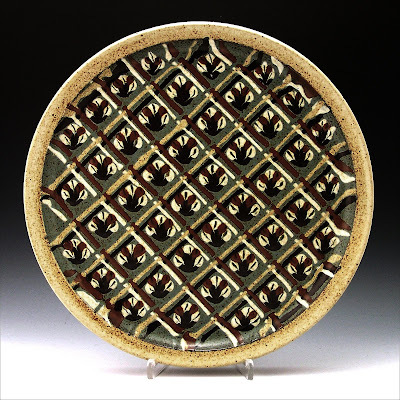 And there is a group of Midwestern potters whose work will always reflect Dave's influence. Sometimes "Try" pays off extrinsically as well intrinsically. ...And now there Dave is, looking at the last big challenge for which he's not been given quite adequate tools. There he sits in Florida. Pottery closed forever. One lung gone and the other almost completely ravaged by the cancer he can no longer fight. I think I'll get the Harmony repaired. Dave died just weeks after I wrote that. I still think about him often. Not a few times I’ve wondered just how Dave would face the challenges of the changing marketplace. Curiously, the new market was right up Dave’s alley – something at which he really was “gifted”. He was heavily into computers way before the internet became big. I’m guessing Dave would have an Etsy site and I’d be calling him still – as I so often did for his wise advice. The Harmony sat around the house for a while. I looked into the cost of repairs with a few reputable luthiers. The cost was always so prohibitive that I’d not pull the trigger on those repairs. But then, through this wonder that is the internet, I met a guy who runs the repair shop of one of the top guitar shops in the country. What’s more – this guy’s passion is restoring old Harmony guitars. And he’s built a national reputation for the quality he puts back into those instruments – always making them even better than they were the day they left the Harmony manufacturer. 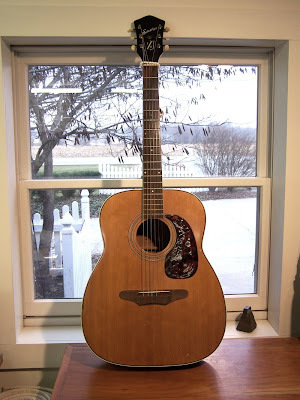 So, through a chain of similarly guitar-crazy friends, I handed the guitar off in Chicago and those friends transported that old Harmony up to my new friend, where it waits for its new life – hopefully, some day, in the hands of a new owner who knows the value of “try”. 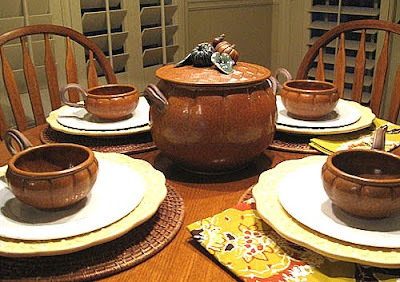 I mentioned in this post earlier last year that, counter to my fears of an impersonal, isolated means of selling pots -- via digital images and words on a computer monitor rather than the face-to-face meetings I had with my customers at art fairs -- I actually was connecting with a number of my new-found customers. I find that quite rewarding. 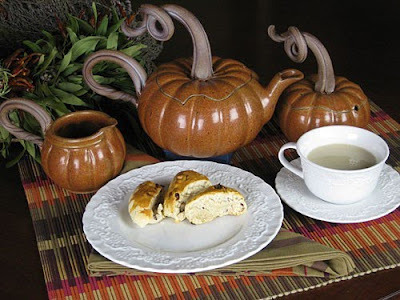 Well, it's happened again as a recent customer from down in Georgia posted the above photo -- a tea set nestled in its cozy new home. I was actually very hesitant to get into selling online because of just that fear -- that it seemed so impersonal. I'm glad I was wrong. 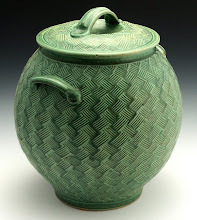 Honestly, in all my years of selling pots via art fairs, I rarely ever saw my pottery in its final destination point. I really like that function of Etsy that allows a photo to be posted in the "Feedback" section of each site. It really enhances the connection made. And thanks for the photo, Susan! I keep thinking about posting this....and then my smarter "why-post-it?" angel sits on my shoulder and asks ...er..."why post it?" But tonight my other angel (sitting on my opposite shoulder. I conveniently have two shoulders for just such angelic polemic) has my ear and so I'm going to tell you. Okay, no big deal. Just maybe you'd get a kick out of it. Anyway, I get to type out stuff on this blog and post it for, like, totally free and stuff, so it doesn't even have to have any redeeming value (good thing, that). At one time I was thinking about starting to write a story (or something like a story). I didn't really have any idea where the story was going to go as a story. It had no plot. It had no reason for the writing. Quite possibly that's the reason it never got written. But it had about a dozen or so vignettes that I really liked. One such vignette I got from combining the stories of two friends of mine. One was an orchard man. The other was a guy named Doug Noreen. I met Doug during his incarnation as a Shaker reproduction furniture maker. But I soon found out (as I got to know him) that he'd made a considerable "fortune" by inventing/engineering (as I remember it) some kind of underwater mining machine. But, no matter how successful, Doug didn't love his life as an engineer. So Doug started making reproduction furniture and, before long, settled in the pastoral countryside near Shipshewana, IN -- one of the country's biggest Amish centers. He bought several hundred acres and, way back in the back of one section -- tucked discreetly behind a hardwood stand -- he started to build his family a log house. Anyway, in Doug's endeavor to build the log house, he learned from the neighbors how to take the huge granite boulders left by the recession of the ice at the end of the Ice Age, and that year after year worked their way up to the surface in the fields and were discarded all along the windrows ..... he learned to take those boulders and, sometimes by sledge and chisel, and sometimes by fire and water, bust those huge suckers into manageable material to make the foundation of his log house. When I first saw the log house, the Noreens had just spent the first winter living in it -- living in the stone basement. In the BEAUTIFUL hand-cut granite stone basement. Doug hadn't just learned to bust up the boulders. Doug had learned to cut that granite into very regular variations of squared-off blocks, and with those squared-off blocks, had mortared up a beautiful, subtly colorful foundation. He had finished that part of the house the previous autumn, covered it with the decking that would become the house's sub-flooring, and had further covered that with plastic sheeting. It had made them a wonderful, weather-tight winter house. Two years later I went up to visit Doug and the log house was then complete. Yeah, Doug had taught himself how to hand-hew the logs and finish the corners into tidy dovetailed joints. He put everything he had into everything he did. Anyway, Doug told me about how he worked the biggest, least manageable boulders -- the ones that he could only see the very tops of, but that extended far into the earth. He said that he'd un-dig them and haul them as much to the surface as he could. He'd then stack LOTS of firewood around them and get a long-burning fire going around them. When they were sufficiently heated through, he would pour water over them. The stress from expansion and sudden contraction split the huge rock, sometimes in half, sometimes in more pieces. In your twenties, plant oaks. In your thirties, plant maples. In your fifties, plant pines. In your sixties, plant oaks with your grandkids. Anyway, I'd gotten the next idea for this narrative that never got written from talking to this walnut grove guy. I thought it such a transcendent idea that he'd be planting a "crop" that he'd never harvest ......... and, further, that he had in mind his progeny. Impacted me, it did. Anyway, when I saw this walnut stand, the trees and the rocks came together in my mind. No, I don't know why. See, the walnut stand is, in some ways, not a terribly impressive or beautiful picture. Not like a wild and natural forest. It's purposely somewhat sparse where foliage is concerned because the higher the umbrella of foliage, the more useful lumber grows beneath. But there are a few cool things about such a walnut stand. One of those cool (to me) things is the straight rows of a man-made "forest". It just struck me as interesting. Animated. I could walk in the rows and feel as though I was enclosed by walls. Or I could walk laterally across the rows and have the feeling of walking through those walls. And when I walked thus across the rows, there was an ever-so-slight sensation like one gets watching the "running fields" that one first notices as a child riding around the countryside -- a passenger in the folk's car. Anywhere the rows of the field run perpendicular to the road on which Dad's driving, those rows appear to be "running" beside the car. And this particular walnut stand was planted on a slight hill, such that I could look up the length of a row of trees and see clearly to a horizon line. That completed this vision I had of this story that I never wrote. I thought about a family settling on this property and one of the first things done (by this family that thinks ahead) is to put in a walnut grove. 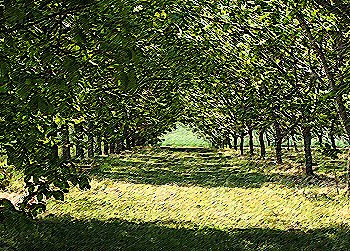 And this walnut grove is planted (as the one I saw) on the side of a hill so that the horizon could be seen up between the rows. And the man of the family (later to be the grandfather of the family) had built the house -- including the stone foundation. And while gathering and working the boulders for this foundation, he had the unusual happen -- an irregularly pointed boulder split virtually in half. So, sappy sentimentalist that I am, I had the guy take one half of the boulder and position it, point up, at one end of one of the rows of the Walnut stand. He then took the other half and placed it at the horizon end of the same row in the walnut stand. And here was to be the sappy part: The two boulder's upturned points would line up with exactly where the sun rose every year on the anniversary of their wedding. I think it never got written because, unlike Thomas Kinkade, I can tell (I hope) when I've painted my house a little too close to the creek.